SAUGANASH — Sauganash is dry no longer. Two years after brewmaster Gary Gulley opened Alarmist Brewing, the neighborhood's only brewery, his small team is finally ready to give neighbors a taproom to call their own. 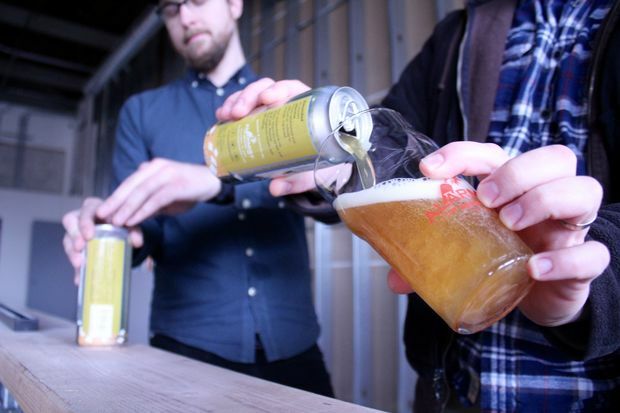 The Alarmist Brewing taproom, at 4055 W. Peterson Ave., served its first customer on Sunday. Gulley and his partners have spent more than a year carving out a beer hall inside their 10,000-square-foot warehouse hidden behind an office park, the former site of the Siebel Institute of Technology. The result is a 28-foot concrete bar, now joined by long tables and a "chill zone" with a plush leather couch. 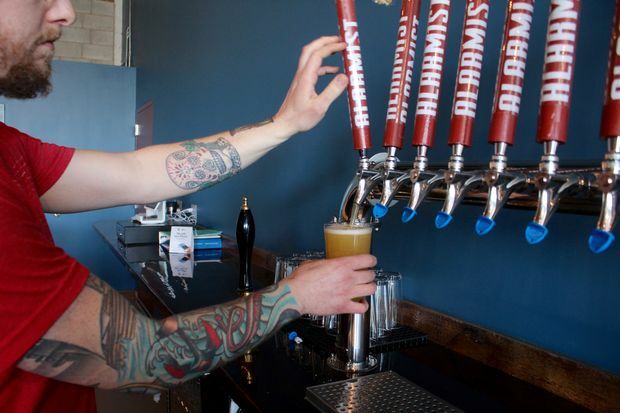 The taproom will have eight beers on tap for their opening, according to brewer Aaron Dahl. In addition to Alarmist flagship beers like Entrenched IPA and Phobophobia Patersbier, the brewery will debut four new brews, including Alternative Facts Belgian Golden Ale and Golden Showers American Blonde Ale. "We're not exactly holding our cards back," Dahl said of the names, laughing. "We just thought it was funny." After scoring their last business permit on Friday, and with Ald. Margaret Laurino (39th) helping lift the local liquor moratorium that's kept bars out of Sauganash as long as most neighbors can remember, the group is excited to open the taproom for locals who previously had to cross the Edens Expy. for a drink. "Almost every day we get people from around the neighborhood coming up and asking when we're going to open, and people of all different ages," Dahl said. "It's a great feeling knowing that we'll be able to cater to all different kinds of people, and not just a single culture, the way a lot of breweries do." Although the taproom doesn't serve food, patrons will be allowed to order in food from local restaurants, said taproom manager Chris Deering. A nearby Lou Malnati's Pizzeria has offered to deliver pizza to the taproom for free. The taproom is open Monday through Thursday from 4 p.m. to 11 p.m., Friday from noon to midnight, Saturday from 11 a.m. to midnight and Sunday from noon to 10 p.m.